The mountains are looking a bit weird oak. Ruben Cassar wrote: The mountains are looking a bit weird oak. 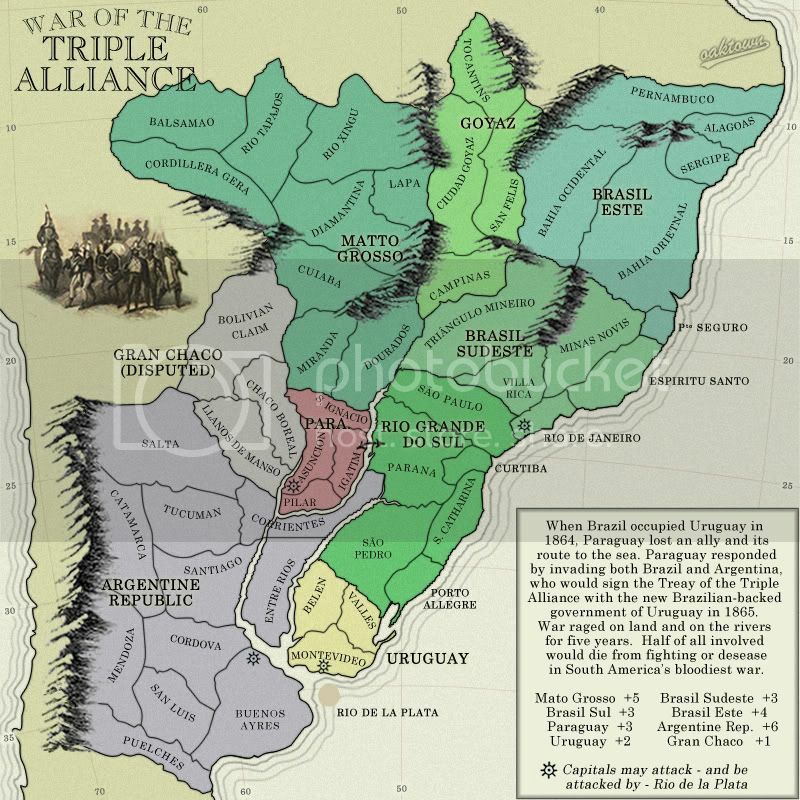 oaktown wrote: I think what I may end up doing is flipping the regions so that instead of having North and South Amazons I have Upper and Lower Amazons. 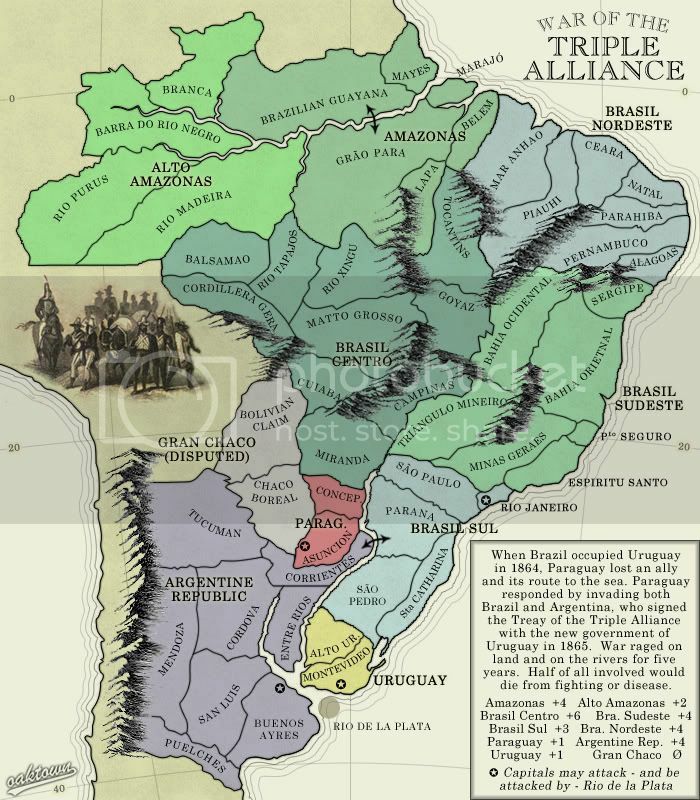 This actually makes more sense geographically, and it means Upper is four territories (RIo Mad, Alto, Barra, Branca) with two borders, just as it is now, and lower is an easier to hold six territories with three borders. This makes sense to me. Rio Mad has 3 points of contact so and that removes the bottleneck bonus. And yes, I like how it is now watershed based. here it is with the regions shifted... the mountains I'll deal with later. I'll simplify the mountain issue, though someday I intend to get this type of mountain right. And for the record, that's three updates on one page. I dislike the mountains as well. They kind of look odd compared to the rest of the colours on the map. As well, they don't look like mountains to me. On the topic of mountains, I don't like how it kind of continues downward near Puelches while the actual game territory kind of cuts off before the mountians end. I can't read the text under "brasil sudeste", as well. dittoeevee8888 wrote: I dislike the mountains as well. They kind of look odd compared to the rest of the colours on the map. As well, they don't look like mountains to me. On the topic of mountains, I don't like how it kind of continues downward near Puelches while the actual game territory kind of cuts off before the mountians end. Last edited by seamusk on Sat Jun 28, 2008 5:42 pm, edited 1 time in total. I feel like the sea color could use a hint of blue. Don't make it fully blue colored, but just add a tiny bit. Also, I'd move the latitude/longitude line layer under the South America continent layer but over the ocean, so you can see them over the ocean but they don't distract from the actual playable map. Any way,do you have in plan to put Army circle on map? Mountains: went back to what I know best. I will perfect the other style of mountain on the Easten Hemisphere map. I will. I'm not ignoring you, Andy, just thinking about what will happen if we cut the Amazon regions. qwert wrote: Any way,do you have in plan to put Army circle on map? First let's see if this map ever makes it out of Ideas. No worries, I didn't think you were ignorning me! I know you wouldn't dare. I like the addition of the History. But the inclusion of the bonuses at the bottom of it almost makes it seem too long and...well...unfriendly to read, you know? Solution? Get rid of some of the northern territories of course! More space for history. Anyways, I'll wander back in and comment again soon. I like these mountains a lot better. Also, in the box where you were describing the war, you spelt treaty wrong. Alright, I'm starting a poll. 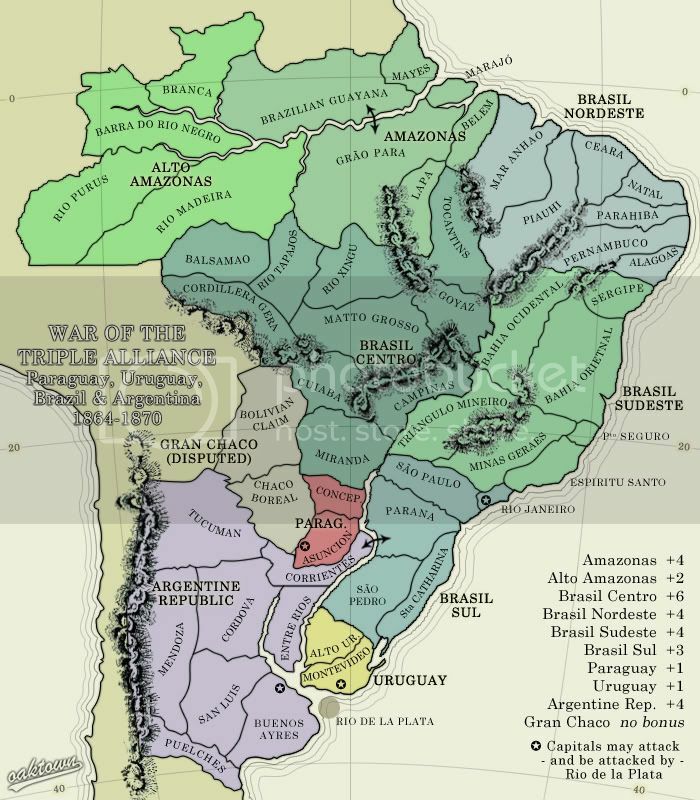 The above image cuts out the north of brazil, as Andy suggested, and represents only the areas which would have seen some action during this war. It does NOT reflect what the map wold ultimately look like in terms of size of regions and number of territories - I'd probably have to add a region, and add territories to the other to bring it up to the size I'd like to make this. 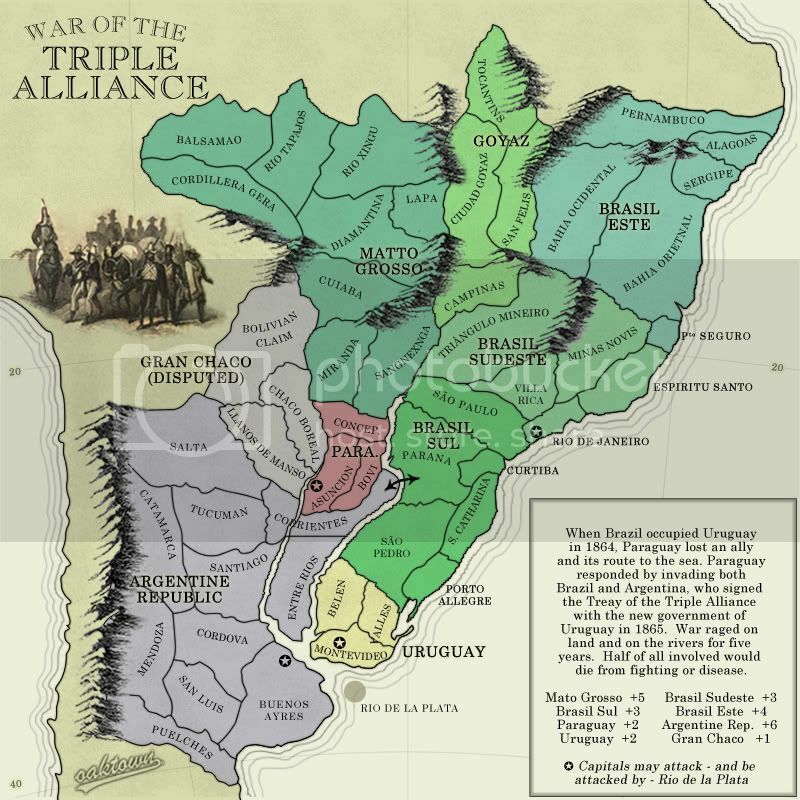 Pros: it is more historically accurate, and I can make Paraguay and Uruguay bigger. I'm probably going to make this change, I just feel better hearing you all tell me to do so. This gives a better sense of what the reduced area map would look like... I'm up to 51 territories, and I'll add one more based on feedback. 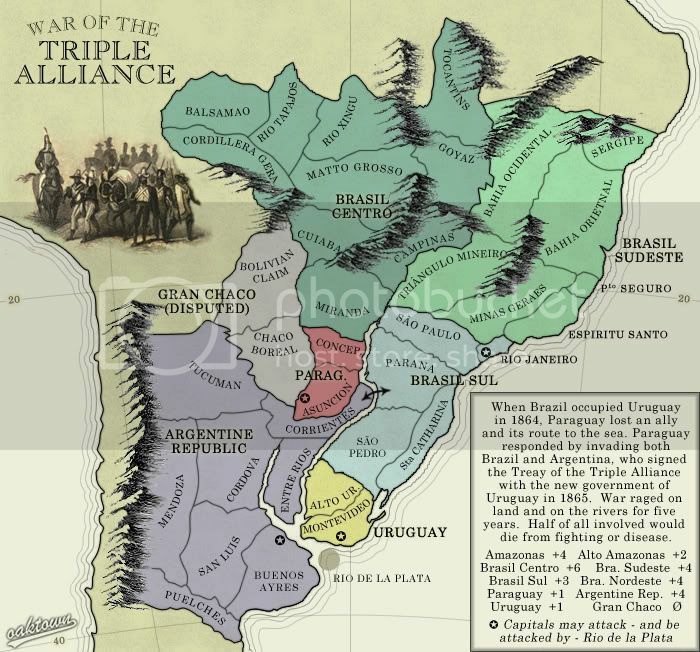 Personally I think either will make a decent map, this is just a bit more true to history, and it allows room for more terriories in tiny uruguay and paraguay. I voted option 1, but the urge to vote option 3 was incredible...I can't believe I didn't! Where's the image for number 3? yeti_c wrote: Where's the image for number 3? 2/3 players: 17 starts, 1 neut. I put the rivers in the right place around Paraguay... had to look more closely at the map. It's better this way, as it creates a nice protective barrier around Paraguay. Added a territory to Paraguay. They started this war, so they should be more important on the map. Historically it's nice to give them a larger bonus as well. Poll results... since nobody is posting in this thread anyway. What geographical region should be represented in this map? I missed the poll, but i vote 1. I like the look of the map, and I am always a fan of Standard game play. Keep up the work. Oak youve become the map machine lately. Um. It says Treay of the Triple Alliance in the map description. Small typo. I think the bonus legend should have some basic color designation. Nothing exciting with this one... added army circles, moved some borders to fit them. May need a bit more space in Paraguay for the small map circles, but the rest of the map works fine as far as territory size. bonuses: I've added Goyaz to the legend, which I somehow overlooked when I cut the map down. It's the same size as Paraguay, but historically it's not as important so I'm thinking I'd like to leave it as a +2. Plus, if somebody wants to go for that region they'll be relatively unmolested as more early action will probably take place in the south. legend: I'll come up with a way to indicate color... preferably not with a minimap. I would like to do the entire legend up right, but let's get this out of Ideas first, shall we?